After a total deconstruction, pallets are changed into individual wooden lengths, already cut modified! 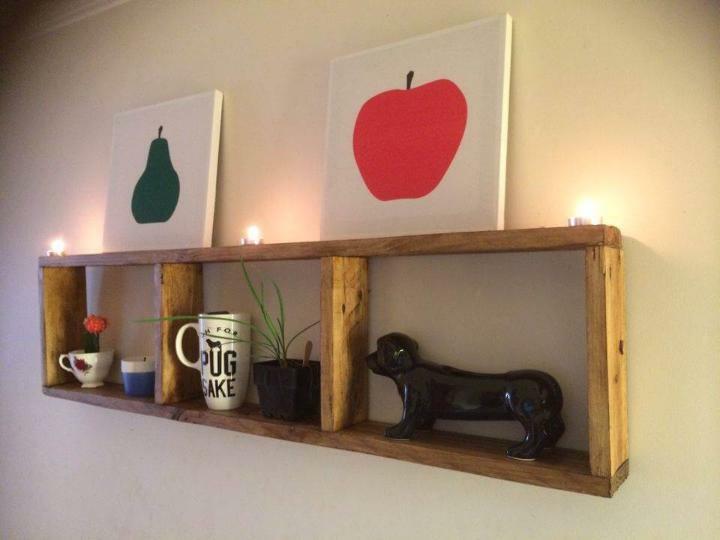 You can really take bigger advantages of these removed pallet slats! Here some of separated apart straight sturdy lengths of pallets have been framed up to build this DIY pallet display shelf, having 3 compartments to display and organize your decorative stuff with care! Overall shape of this install shelving unit is rectangular and hence this leads to geometrical wall decors which are becoming favorite to everyone in these days! You can enlarge this shelving unit to get any custom geometrical shape to load more stuff and also to create a perfect beauty station on a blank wall area! 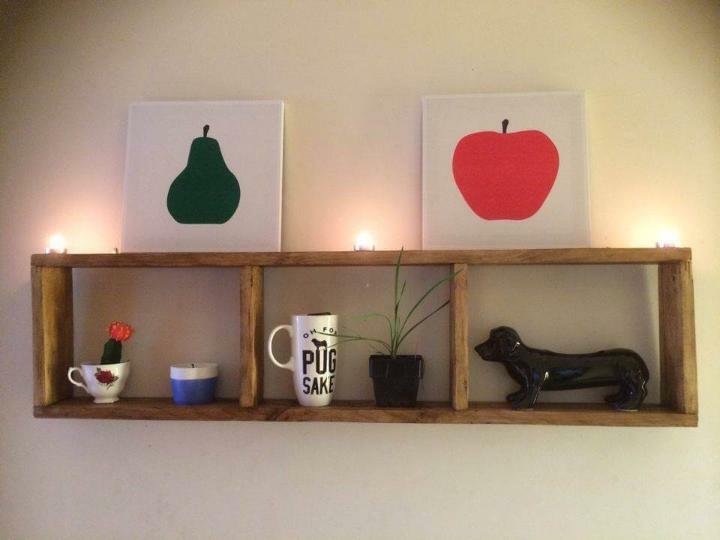 Make the walls distinctive that mostly get overlook using DIY pallet shelves and wall art ideas because this is only the free solution to get your wall aesthetically pleasing and functional as well! Sand this shelf or bring it into prominence using a perfect stain shade! Paint would also come in handy if you want to spice up the overall hue of this geometrical wall shelf! Build a hollow box by putting together pallet slats and just put the dividers in to create different compartment to display a variety of stuff that hold dear to you! By giving a creative width to this shelving plan you can get fully functional book racks, wall hanging beauty stations and also amazing wooden showcases! This is a simple framework we shared with your but you can go a bit extra creative to install more amusing display units!